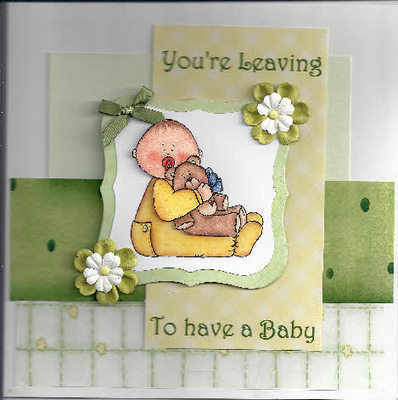 'You're Leaving' Card in lemon and green in layered colours with a baby topper decorated with bow and green and cream flowers held in place with green brads. Ideal card for someone leaving work to have a baby. This card has been left with a blank insert but verses can be added if you so wish. This price includes UK postage and it will come to you directly from Sue, the maker. If you are not in the UK, please contact Sue before purchase.